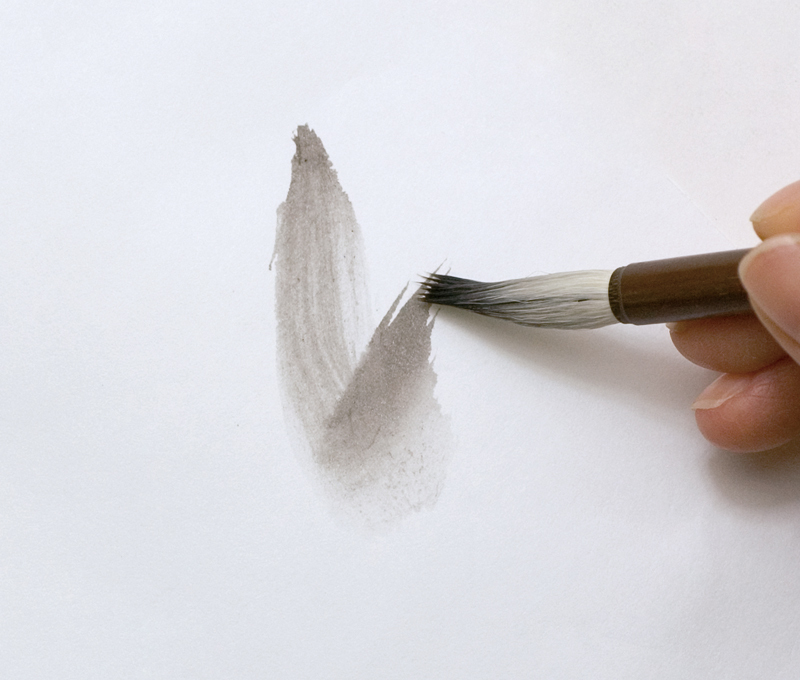 Tsuketatefude is a brush that is mainly used for drawing with sumi ink and is also called mokkotsufude. In ink paintings, there is a technique called mokkotsu (a type of coloring technique in Chinese paintings) in which objects are rendered without an outline and the shape is simply expressed by the wash. This technique exploits the structures of the brush to the full to produce a wide range of expressions such as dark, light, wet, dry, slow, fast, etc. Tsuketatefude is particularly cut out for this task because its tip can be aligned lengthwise and its rounded shape can be used to produce contrasting shades. A wide variety of tsuketatefude is available but the most common is Choryu which has superb ink holding properties. 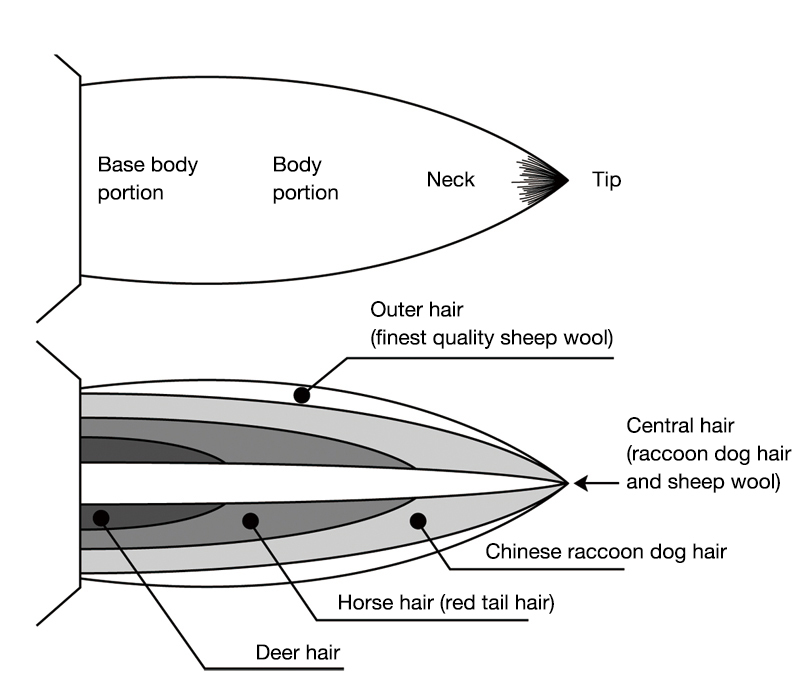 It is usually made of quality wool, with a mix of horse and deer hair to give the brush firmness, and has a tip made of raccoon dog hair. Other types include Gyokuran, which is used for practicing brush strokes, Sanba, which is a hard and rough brush made of deer hair, and Josui, which is made of wool and has a long narrow tip. Each type has a different hardness and firmness so they should be selected according to the desired effects. A good brush will have a well-aligned brush tip which does not split in use and adequate firmness so that brush will not droop and bend in the middle. Another important point is for the brush to allow ink to be applied smoothly without the line breaking halfway through. 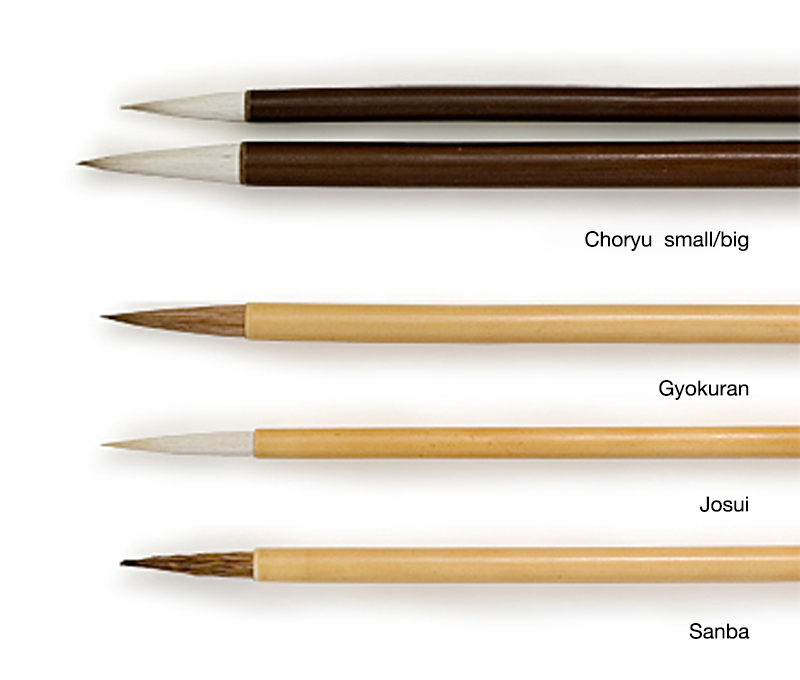 Some other types of brushes such as sokumyoufude and shujiyoufude also have sufficient tip length and good ink holding properties and are thus similar to tsuketatefude. Wash in cold or lukewarm water after use and drain off excess moisture. Leave to dry on a towel in a well-ventilated location not exposed to direct sunlight. Note that leaving the brush on a brush stand with the brush tip facing upward could cause moisture to collect at the base and damage the brush. Tsuketatefude can be purchased at art supply stores that handle Japanese art supplies as well as at general art supply stores.